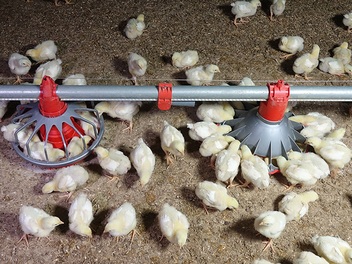 The KONAVI® Feeder from Chore-Time lets beaks in, but keeps feet out. 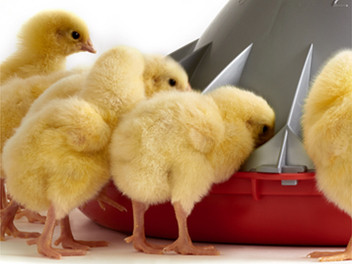 With its low pan height and patented scalloped edge, chicks eat from the outside of the pan from day one. 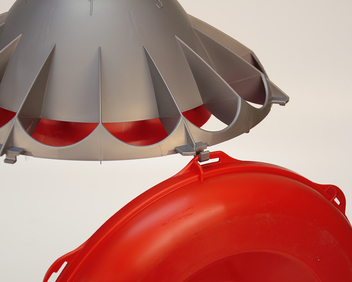 Its unique angled cone with anti-rake fins discourages birds from stepping into the pan and wasting feed. 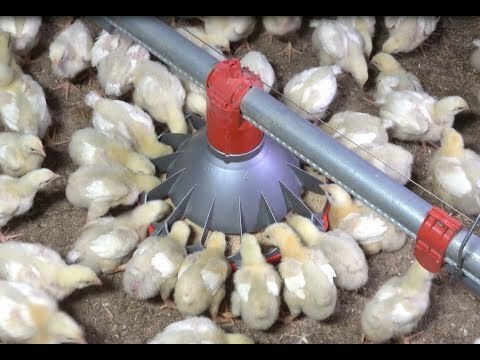 Low pan height with patented scalloped edge gives birds comfortable, easy access to feed throughout their growth cycle. 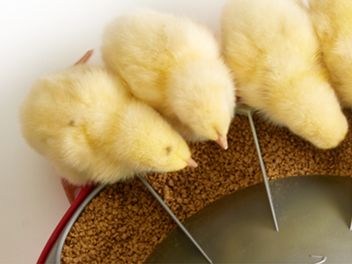 Flood the pans with a high level of feed to attract day-old chicks, then use one of three grow-out settings for finishing birds. 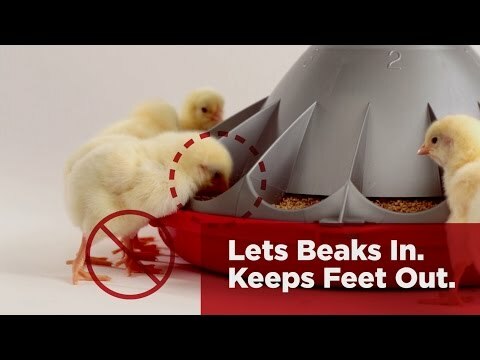 Angled cone with anti-rake fins discourages birds from stepping into the feeder and scratching feed out of the pan with their feet or beaks. 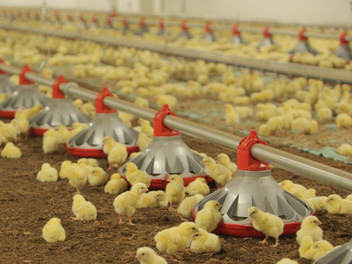 Design helps keep feed clean and uncontaminated – improving feed availability and feed efficiency. 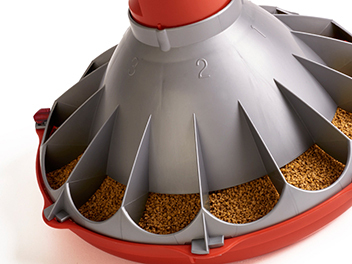 Birds naturally tend to eat from outside of the KONAVI® Feeder, resulting in reduced feed contamination. Young birds may climb up on the feeder, but they typically do not stay there long. Most importantly, birds are inclined to face inward toward the feed, so most droppings fall outside the pan. 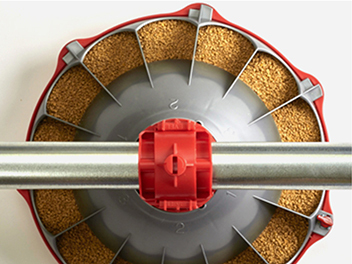 No grills, corners or pockets to trap feed – permits more complete cleaning of the feeder. 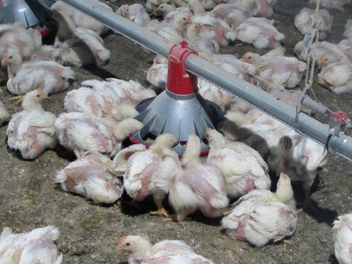 Simply power wash KONAVI Feeders between flocks for better bird health. Feeders include a single lever for easy opening of the pan for cleaning while cones have incorporated hooks for hanging pans. Made using heavy-duty, durable polypropylene plastic. Engineered to resist the effects of ultraviolet light. Eating area of the pan is thicker for long life – 3.8 mm (0.15 inches). 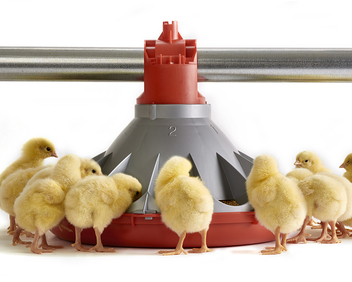 The KONAVI Feeder is available in floor and colony feeder configurations. 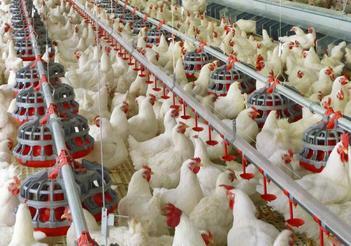 An optional slide shut-off lets you easily control feed flow to unused areas of your poultry house or colony system. 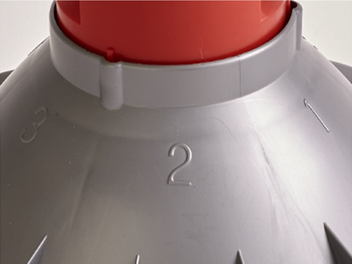 Chore-Time engineers designed the KONAVI® Feeder from the ground up to meet the needs of global feeding practices and houses where minimal or no litter is used. 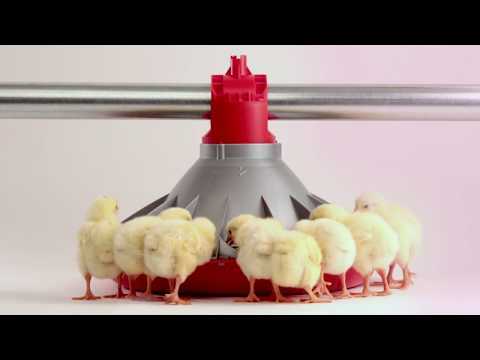 With an ultra-low pan height, it lets the smallest chicks reach the feed even when they are not boosted by the height of the litter. 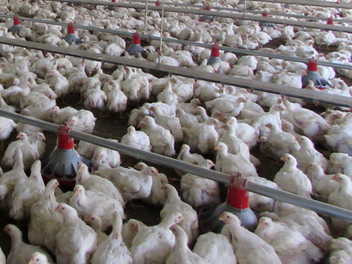 Its simple design also works well in a wide variety of traditional broiler production environments.